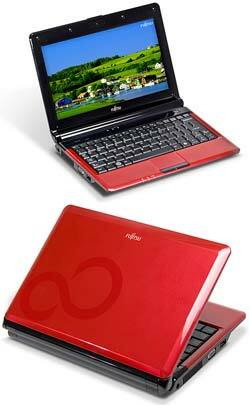 Fujitsu has launched a new netbook-class computer for education--its first in North America. The M2010 Mini-Notebook, which debuted Tuesday, comes in a 10.1-inch WSVGA configuration and ships with Windows XP Home. The M2010 features a 1.6 GHz Intel Atom processor and Intel Graphics Media Accelerator 945GSE (up to 128 MB shared memory). It includes a 160 GB, 5,400 RPM hard drive and comes equipped with 1 GB standard memory, expandable to 2 GB. Its candy apple-red case is not painted; rather, the color is in the material itself, which, said Paul Moore, Fujitsu's senior director of mobile product management, is one of the features built into the system that makes it practical for K-12 environments. The 10.1-inch screen reaches a maximum resolution of 1,024 x 576, and it includes support for external display resolutions up to 1,600 x 1,200. Card slot for Memory Stick, Secure Digital, Memory Stick Pro, and MultiMedia Card. The M2010 Mini-Notebook is available now for $449 in the three-cell battery configuration (2.5-hour anticipated life). The six-cell battery option runs $129 extra. The unit includes a one-year warranty. Further information can be found here.